Two copies of the popular Big Christian Ideas Student Book and one Big Christian Ideas Leader's Guide for examination by teachers, Directors of Christian Education, pastors -- anyone interested in an economical preview of this exciting new study program. One of the church’s most popular study programs when it was first released in the 70’s, Big Christian Ideas by Ronn Kerr has been completely rewritten to reflect modern theological trends and interests. It has been reformated and republished in the popular 13-week study format of First Persons and Disciples and Other Sinners which have become popular as occasional alternate studies for dated Church School programs. Big Christian Ideas assumes that all adults and older youth have beliefs about God, Christ, the Holy Spirit, Salvation, Sanctification, the Church, Discipleship, Hope and dozens of other ideas and it is designed to help them identify, affirm, understand and classify what they actually believe. Big Christian Ideas does not teach a particular theological or doctrinal stance and no ideas are identified as denominational or related to any specific group. Further, no ideas are listed as heritical or outside of the mainstream. Instead, it covers the many different ways people have believed about various ideas both historically and today. Often, ideas are shown as absolute opposites just as they are in the real world. The focus is on helping students identify and affirm what they believe, even if their beliefs are radically different from the beliefs of the person sitting next to them. This is not an easy study but it avoids technical theological language as much as possible and carefully defines theological terms when they are necessary. It is aimed at persons who are theologically curious but not theologically trained. In the classroom, Big Christian Ideas evokes animated discussion as students compare ideas, contrast their positions and, ultimately, affirm the variety of ideas they share. 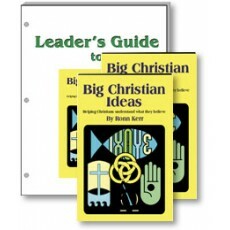 The extensive Big Christian Ideas Leader's Guide is loose-leaf and 3-hole punched so that it can be easily distributed to various session leaders without having to make sure the Leader’s Guide gets to the right person every week. The Leader’s Guide contains scholarly Biblical background material, leadership suggestions, and creative discussion starters tied to each story. This thirteen-session course is perfect for a Lent or Eastertide study or as a substitute for those quarters when regular dated studies just don’t work.